It is very common amongst expectant mothers to have a third-trimester growth scan, between 28 and 32 weeks gestation, to check that their baby is growing the way it should be. Here we look at some of the frequently asked questions surrounding this scan such as why it is needed, what happens during and what can the results tell you. Why do you need to have a growth scan at 32 weeks? What happens during your 32-week growth scan? What does the 32-week growth scan tell you? 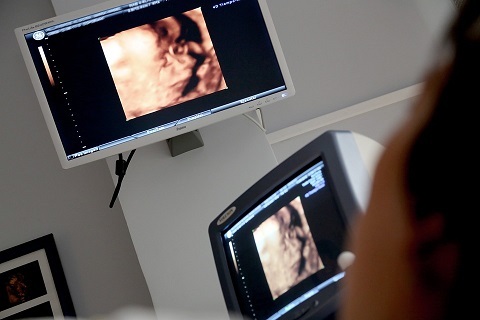 From this scan, the sonographer will be able to see if your baby is small for gestational age (smaller than expected), possibly due to a lack of the necessary nutrition through the placenta or restricted levels of oxygen. Or if your baby is larger than expected, which is usually not a medical concern. If for some reason your baby is significantly larger than expected, you may need to get tested for gestational diabetes, a measure for the levels of glucose in your blood. High levels could result in birthing complications and enhance the likelihood of induced labour or a caesarean. In regards to the position of your baby, this scan will show whether your baby is head down (normal position), feet first (breech position) or laying sideways (transverse position). Your doctor may advise you to have an ECV (External Cephalic Version) if your baby is in breech position. This is a completely safe procedure whereby a surgeon pushes down and around on your abdomen in order to turn your baby into a normal head-down position for birth. Here at First Encounters, we offer a fantastic growth scan package that is available to you from 14-40 weeks gestation. Our growthAssure™ scan focuses on many of the things listed above such as growth and weight calculations, placenta position, fluid volume measurements and identification of baby position. All of which is documented in a growthAssure™ Report that you can take home and keep. To view further information on this scan or any of our scan packages, hit the links below! If you have specific questions regarding any of our ultrasound scan packages, please do not hesitate to get in touch with us today – contact or send an enquiry.